First of all, I’m still not sure why this dessert is called a salad. Oh well, whatever its name is, it’s delicious. I’ve made this a couple of times for family gatherings and it always seems to be a hit! It does take a a bit of prep time, so this really isn’t a last minute, throw together, type of dessert. But, if you have the time it is worth it! I found the original recipe a while ago on the Paula Deen website, but hear me out! The version I make is more based off of her son’s lighter version found here. I’ve cut out a lot of sugar and butter that her original recipe called for, without taking away any of its taste! *To crush pretzels, I put one handful of pretzels at a time in a gallon sized plastic bag and gently roll over it with a rolling pin. I continue to do this until I have measured out 2 cups. 2. 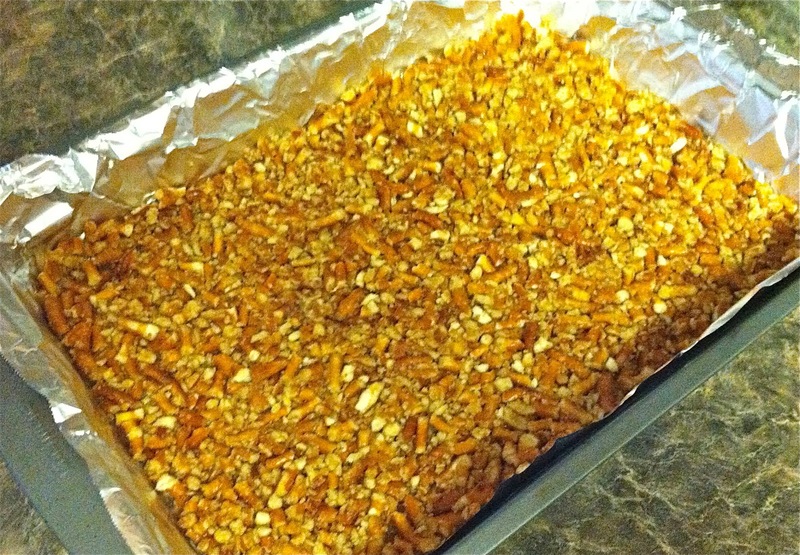 Stir together crushed pretzels, melted butter, 2 tablespoons of sugar and applesauce. 3. Press mixture into the bottom of a 9×13 inch sprayed or tin foil lined pan. 4. Bake 8-10 minutes, then set aside to cool. 5. 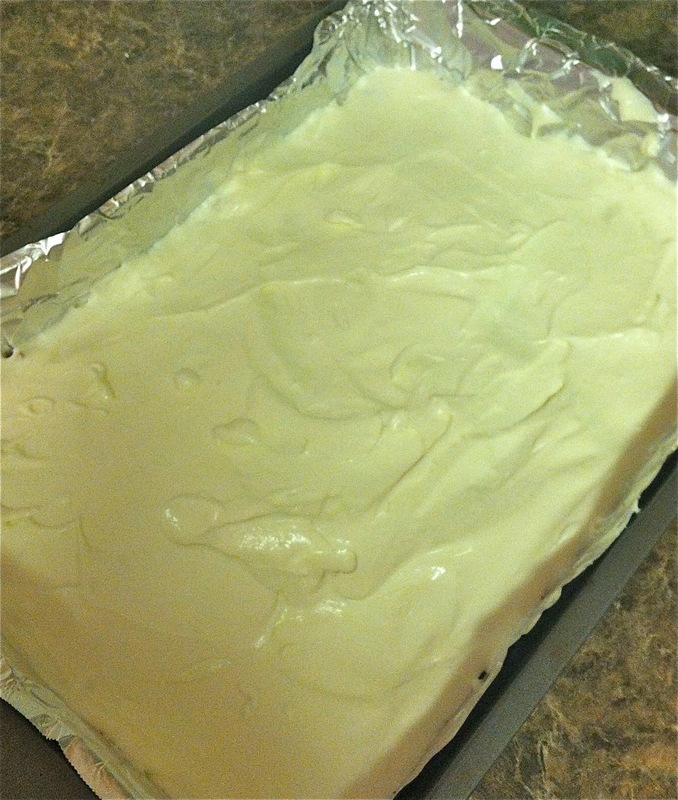 In a large mixing bowl, cream together cream cheese and 1/4 cup sugar, then fold in whipped topping. 6. Spread the cream layer over the pretzel layer with a spatula, making sure to seal off the edges with cream. Place in fridge to set. 7. Meanwhile, boil two cups of water and pour over jello, then stir to dissolve. 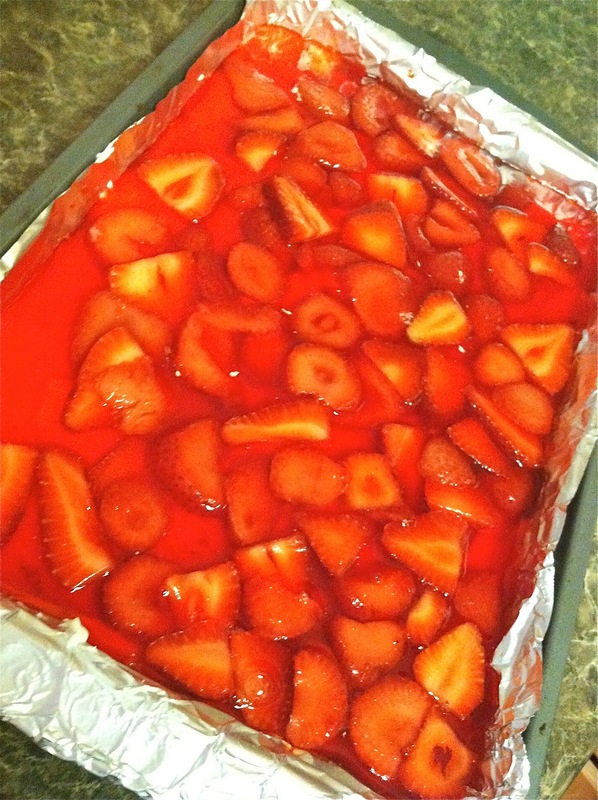 Stir in the frozen strawberries to the jello and allow to set briefly, until it is the consistency of egg whites. 8. When the jello layer is the right consistency, pour over the cream layer. 9. Refrigerate the strawberry pretzel salad for at least 1-2 hours. I love pretzel salad! Looks delicious!